The latest Workforce Scotland Newsletter is now out! Click here to sign up for the newsletter, or read below to catch up on all our latest events and offerings. Between 23rd and 30th January 2017, Workforce Scotland will be hosting and supporting the Fire Starter Festival, a week-long festival of collaborative learning events, illuminating creative, disruptive and innovative ways in which we can all transform ourselves, our organisations and the wider system. The First Minister has provided a clear commitment to empowering individuals and communities to become involved in designing public services. 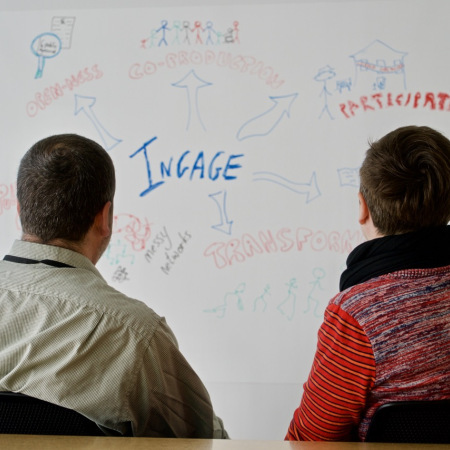 Many people across Scotland are currently lighting their own small fires by exploring genuine, participatory methods of engagement, creating innovative and transformative changes. Day 5 of the Fire Starter Festival was an opportunity for colleagues from across public services to come together and try out some of our Workforce Scotland tools. Janet Whitley, Ingage Division lead, blogs for us about two of those tools: the Enabling Collaborative Leadership Pioneer Programme and the Dialogue Community of Practice. We began with a taster of the Enabling Collaborative Leadership Pioneer Programme, which is an offer to work with collaborative teams (‘Pioneer Sites’) across public services on real work issues where there is a need to find different kinds of solutions to complex challenges. The approach is built around a core model of action inquiry, supported through a team of facilitators and a shared commitment to learning as we go. For me, hearing some of the stories from the collaborative teams that we have been working with really brings the programme to life. This approach has made a real difference to how they have worked and the outcomes they have achieved. Colleagues from the Musselburgh Pioneer Site shared some of their experience of working with families who were intensive users of multiple services, beginning with the questions: “What is it like to be in this family?” and “What is it like to be me as a practitioner working with this family?” This approach has really changed how they’re thinking about this work. Read the latest Workforce Scotland newsletter now!